The thrift stores have been lame lately! I've seen furniture that's peeked my interest but really I don't 'need' more projects. 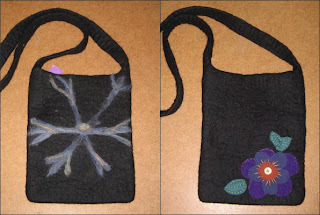 I did find this felted wool purse for $1.50 yesterday. I peeled off the wool stars and made a felt applique flower for the front. I'm not really into purses myself - I have my bag that houses my craft projects and that's all I need. It's all about function! This purse will be part of my 2009 purge. The plan is to clean house so I can start fresh for 2010. That means lots of pillows, booties and furniture will be finding new homes in the next month or so. 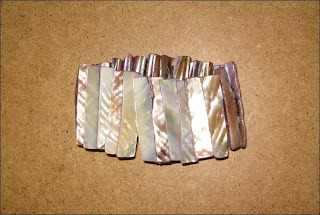 I bought another pearl bracelet - I paid$0.50 for it. I plan to take it apart and use it for something! I love pearl pieces.